Now firmly in Brazil and really, really trying to stop using my Spanglish and embrace the Portuguese language, we left The Panatanal. It was time to explore a little bit more of this vast country, that promised us warmth, better food and proper beds. I can’t lie, Bolivia had been tough – breathtaking but basic. Being properly in Brazil was thrilling, especially as throughout my travels there’d been such a focus on this beast of a country due to all the World Cup coverage. First stop Bonito, a modern town a little lacking in soul but here was to be the World Cup Final viewing place. So we reserved our places in a bar perhaps a few hours too early. An eclectic bunch of Canadians, Australians, Brits and one Argentinian, we immediately started ordering a mix of what were to be deadly cocktails. ‘The Devil’ – ‘Puts you on your back’. You can guess the rest! 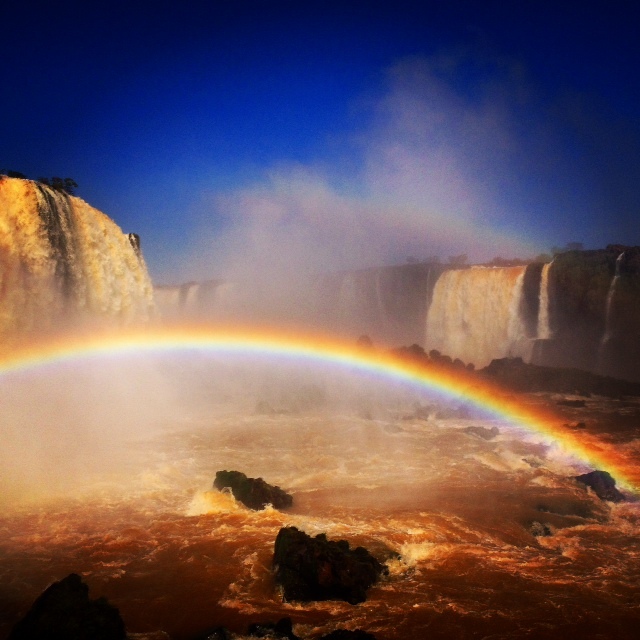 I couldn’t travel through Brazil and not see Iguassu Falls – a more grounding, magical place would be hard to find. As if miles of gushing water across stunning landscapes wasn’t enough, nature did its thing and produced dozens of rainbows, which popped up out of the water. I felt like I’d stepped into a fairytale. I also spent a day in Argentina, checking the falls out from that side but due to flooding a lot of the paths were blocked off, so it was only polite to gorge myself on Argentinian steak – err amazing! It felt right to see the falls from the water, which meant taking a speedboat, let’s just say it was wet and due to the umm shitloads of water hammering down I didn’t actually see anything. But, I did get a tiny idea of how powerful the waterfall is and I’m completely in awe of this natural wonder. Travelling on to Paraty on the South Atlantic coast of Brazil. 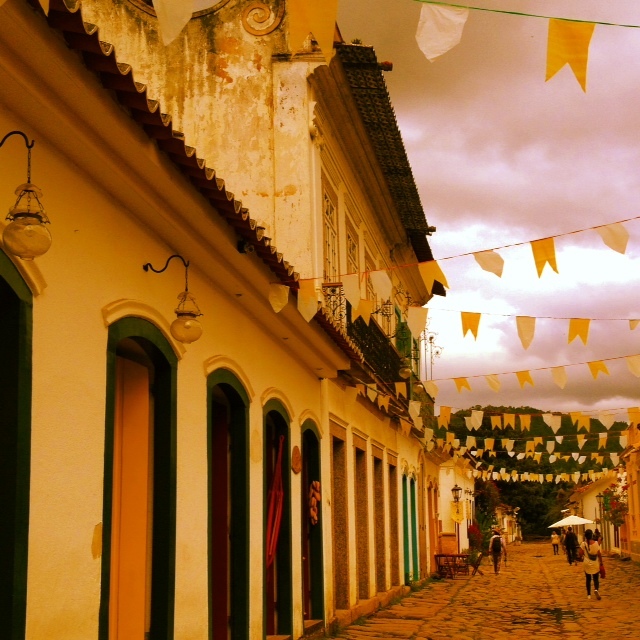 Ahh Paraty, it is a gorgeous colonial town which they’d coated in yellow and white bunting for my arrival. Well for a Catholic celebration but it gave the whole place a festival feel and so we erm partied with the Brazilians. It would have been rude not to sample the Caipirinhas, especially the passionfruit ones – almost like healthy alcohol. Definitely one of your five a day. We sailed around the nearby bays, jumped from the boat into the cool, clear waters, stole the captain’s pink crocs and one of our gang may have accidentally radioed for assistance. Oops. As night fell we watched some local guys perform Capoeira – google it if you aren’t aware of it, it’s an impressive mix of martial arts and dance and clearly leaves you with a body of a God. 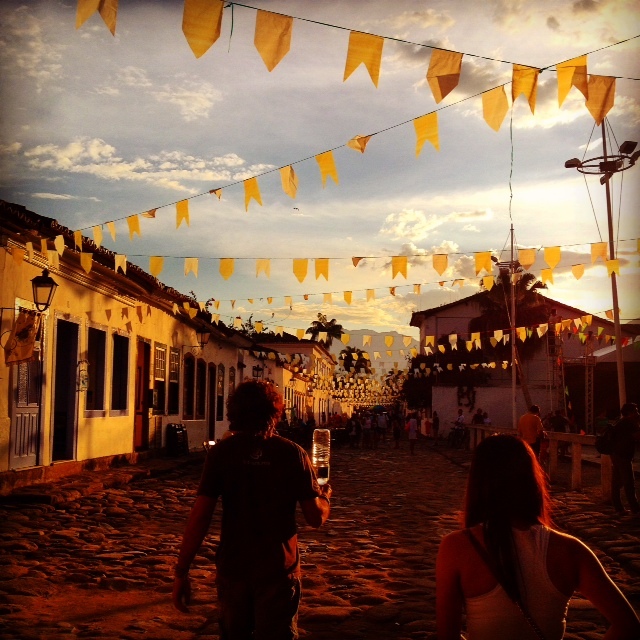 I loved Paraty, it’s a party town but full of culture too. The streets are cobbled, the shops are quirky and the harbour is beautiful. We spent a few days here and it felt like ‘the holiday’ had begun. But there’s always somewhere to head to next and Ihla Grande it was. 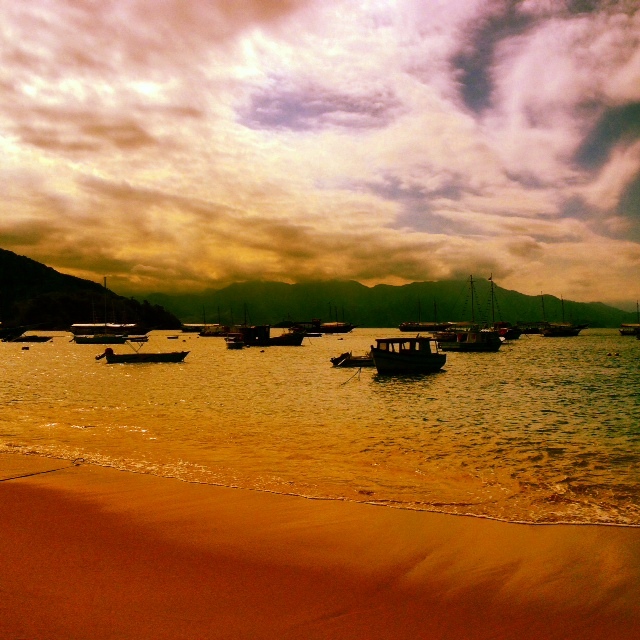 An hour or so away by boat, direct from Paraty is this fantastic island getaway. We moored in the sandy harbour and strolled straight to our accommodation. I chucked my rucksack down and flung open the balcony doors and inhaled the sea view. Everywhere I looked there was a mixture of mountains, lush green forests and then the beautiful ocean. Days here consist of beautiful walks, a hidden overgrown prison, stunning beaches and a bit of mountain trekking if you’re up for it to the ‘Parrot Peak’ (I wasn’t as I’ve retired from mountain trekking!). There’s some cool little jewellery shops, Havaianas a plenty and some tranquil places to eat. We sat on the beach at dinner time, under the stars, with waves lapping our chair legs. Ihla Grande was the perfect place to unwind before heading to the bright lights of Rio.